We have all the right equipment and experts to safely remove trees. We can remove large trees. We will quickly and safely remove hazardous trees. We have stump grinders for every sized job. Unfortunately, there are situations where trees or shrubs need to be removed. Dead, diseased, or dying trees with defects or trees too close to structures or other trees are all good examples of when to have a tree removed. Mountain High is fully experienced and equipped to safely remove any tree or shrub. 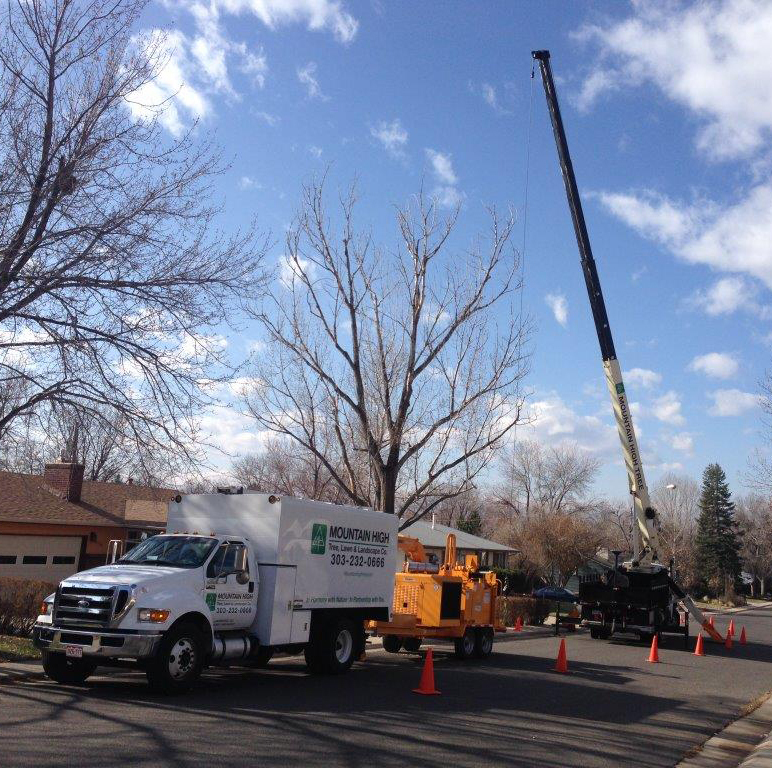 We are one of the few companies in this area to have our own crane, which can make tree removal safer, quicker and just about disturbance-free to your property. We simply lift the dead tree up and put it in the street. We have a Crane for large tree jobs in difficult to reach places. Need tree removal? We have Certified Arborists and staff, and are fully equipped, licensed and insured to do any tree removal job. We will remove trees safely, and complete the job with stump grinding to prevent further growth from the roots. We have amazing lift trucks and even one of the largest tree-removal cranes in the state so we can work on tree removals in hard to reach spots and prevent property damage during the process. Our stump grinders can get through small gates. Once a tree is cut down, we can also grind out the stump—assuming it is in a location where we can bring in the necessary equipment. Depending on the size of the stump, it’s often not a good idea to plan on planting another tree in the exact same location. It’s usually a better option to move over several feet in any direction. However, planting grass or flowers where the stump used to be is generally fine. If you’re in a hurry and want an entire tree stump removed immediately there is no better method than a stump grinder. Stump Grinders accomplish their task by means of a high-speed disk with specially designed teeth that grind the stump and underground roots into small chips for easy removal. Once the stump is removed, you can then grow grass, put in a garden bed, or even plant a new tree. We have several different sized stump grinding machines to handle any stump removal job. We also have small hand-push stump grinders that can get into smaller gates or tight spaces. If you’re sad to see the tree go, we can even replace the tree with a new tree with our tree planting service.